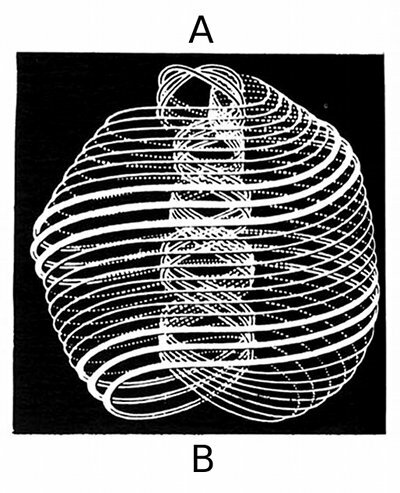 The atom in man and man in the cosmic type atom. The Adam Kadman [Adam Kadmon] of the Cabbalists [Cabalists] also the sephirotic tree of life. It is similar to the Mercavah [Merkabah, Merkava, Mercabah] or Chariot of Jehovah, which Ezekiel saw by the river Chebar and said it was a wheel within a wheel of energy whirls. The lord as spirit energy above and the four divisions of air - fire - water and earth substances typified as man - lion- eagle and bull and the cherubim as cosmic energy. 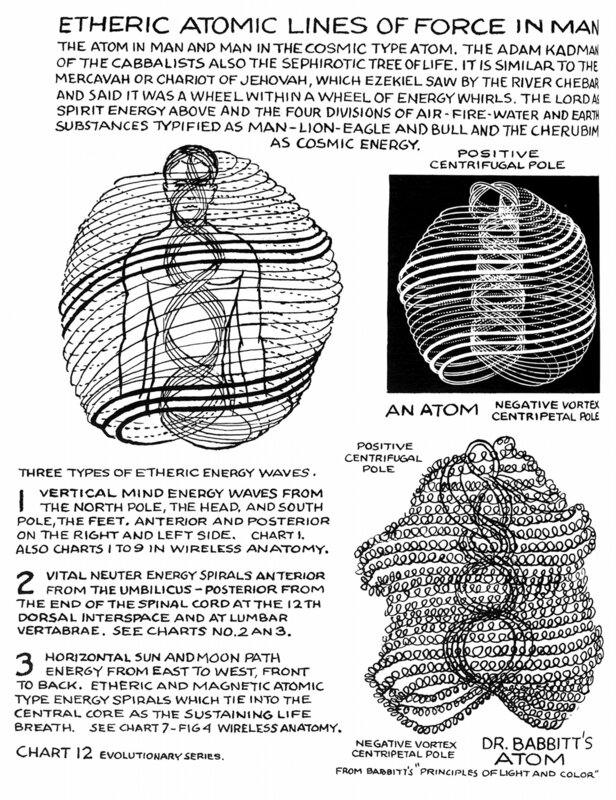 Three types of etheric energy waves. 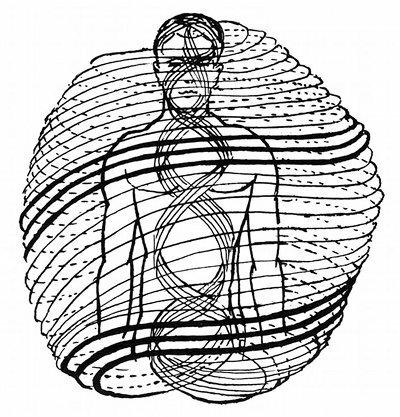 1 Vertical mind energy waves from the north pole, the head, and south pole, the feet. Anterior and posterior on the right and left side. Chart 1. Also Charts 1 to 9 [Charts No. 1, 2, 3, 4, 5, 6, 7, 8, 9] in Wireless Anatomy. 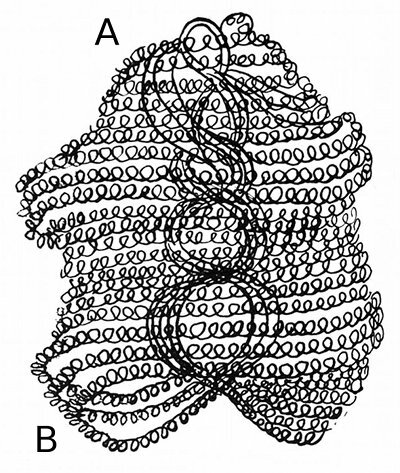 2 Vital neuter energy spirals anterior from the umbilicus - posterior from the end of the spinal cord at the l2th dorsal [twelfth thoracic, T12] interspace and at lumbar vertabrae [vertebrae]. See Charts No. 2 an [and] 3. 3 Horizontal sun and moon path energy from east to west, front to back. 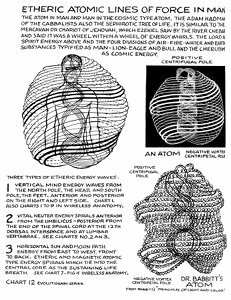 Etheric and magnetic atomic type energy spirals which tie into the central core as the sustaining life breath. See Chart 7 - Fig. 4 Wireless Anatomy. From Babbitt's "Principles of Light and Color"
2 Dr. Edwin D. Babbitt (1828-1905), an American physician who pioneered color therapy and the medicinal use of colored light.